Construction workers, contractors, hobbyists and others use cable cutters and cable cutting machines to cut through various types of cable. A cable cutter generally refers to a portable, manually operated device while cable cutting machines are motor-driven and may utilize microprocessors for programmed cutting routines. Because cable is often thick and covered with tough casing, manual cable cutters must have strong blades, usually made of steel, and they must efficiently leverage the user’s power. Coaxial cables – Used for electronic and digital wiring including CCTV, VSAT and data networking. Coaxial cables typically are strong, durable and fire-resistant. Shielded cables — As the name suggests, these cables have special outer protection. Power cables – A power cable includes a conducting metal like annealed copper and outer insulation like PVC. The cables are resistant to heat, water and oil damage. Screen cables – Highly durable capable designed to screen out external radio frequency (RF), electromagnetic (EMP) and other types of interference. Instrumentation cables – These cables typically must have low noise levels since they must accurately deliver signals from instruments. Flexible cable – Flexible cable is typically for use in housing and buildings with AC or DC power systems. The cable is high quality with ratings for conductor and insulation. Signal cables – These cables have heavy insulation designed to withstand high temperatures. Fire alarm cables – Fire alarm cables must be able to withstand high temperatures associated with accidental fires. Typically, these cables have fire retardant treatment to prevent combustion. PCM cables – Used for low-level signal communication, these cables have a multi-core design. Most people use portable hand-held cable cutters for work with common types of cable including coaxial cable. The most common cable cutter is the one-handed device that uses two steel blades and high leverage handles. These cable cutters are either ratcheting or non-ratcheting. Not every cable cutter can deal with all types of cable. Indeed manual cable cutters are limited to handling only the smaller cable types. The one-handed cutter is for thin cables while the two-handed manual cutter can handle heavier cables. The thickness of the cable is not the only consideration as the user must also consider the materials used for conducting and casing. Size and portability – Will the cable cutter fit in a pocket or on a tool belt, for example. Combination device – Does the cable cutter also act as a stripper? Durability – What are the construction materials? Are the blades heat-treated? Cutting capacity – Cutting capacity will depend on the type of cable material involved. For example, copper is typically the easiest conducting metal to cut through followed by aluminum. Adjustable – Are the blades adjustable to deal with different types of cable? Comfort – The handles will typically have soft plastic or vinyl coverings to make for increased comfort. Insulation – Is the cable cutter insulated to protect against electrical shock? Price – How does the cutter compare to other competitors on the market? A heavy duty ratcheting cable cutter will allow the user to cut through steel cable using two hands. These devices will have long handles to increase leverage. The first thing is to check to ensure that the cable cutter can handle the thickness and type of cable involved. The user then opens the cutter jaws and places the cable in between the jaws at the selected point for cutting. By griping the handles and then squeezing them together, the jaws are able to cut through the cable. For two-handed cable cutter, the user grips each handle and then pushes them together to make the cut. Be careful that energy is not flowing through the cable when cutting. If you are working with electrical cables, it is a good idea to use insulated cable cutters as an added precaution. For high volume industrial purposes, cable cutting machines use motors and other equipment to deal with large quantities of cable. Most machines can handle different types of cable, but only a few will cut all types. The machines have electric or other types of motors and they may also use gas compressors. Most modern cutters have their own computer chips and memory storage devices that allow for programming of cutting routines. These software systems allow for batch processing and use of different measurement systems. Cable cutting machines will have an automatic feed systems or a conveyor belt system that keeps the work flowing at a fast pace. Some machines only cut one cable at a time while others can simultaneously feed and cut multiple cables. The size of the machines can vary widely. Some are small and portable, while others are large enough for production line-type operations. Does equipment support batch processing? Are there programmable feed speeds? How much computer memory is available? Does the equipment have sensors for reloading and cut quality? Does the equipment have automatic power supply switching? What type of safety features are present? Most machines require that the user program the equipment before beginning the cutting routine. Once the user makes the proper selections, the next step is to load the cable into the feeder or conveyor belt system. Once the feeding system is ready, the user starts the machinery and watches over the operation to make sure everything runs smoothly. The operator must also reload the system for continuous operation. Cable cutters are common tools and they are available here at the Eraser Company. You can order via our website where we sell cable cutters online or feel free to purchase over the phone. Quality cable cutting machines are hard to find and we created Eraser.com to make it more convenient to browse our equipment. As these machines are a major investment, it makes sense to take the time to compare our different products and contact a sales engineer. 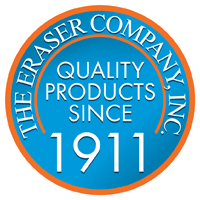 Trust our American-made products, from the well-known Eraser Company brand name, made with the highest quality manufacturing standards. Some website offers hundreds of mire processing machines and products including fiberglass erasers, dereelers and reelers, and infrared heat shrink equipment. You can also see videos demonstrating many of our wire cutters and other tools in action.